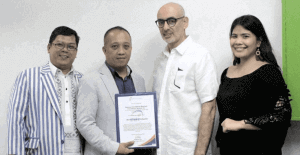 DAYANAN president Jake Gacus (2nd from left) and director David Elefant (3rd from left) during the signing of the partnership agreement with Moores-Rowland Philippines & Co. (MRP & Co.) last December 28, 2018. With them are MRP & Co. managing partner Neil Sison and program head Beverly Buenconsenjo. are MRP & Co. managing partner Neil Sison and program head Beverly Buenconsenjo. member firm of Moores-Rowland Philippines & Co. (MRP & Co.). members with access to networking, business consultation, marketing, and training opportunities.